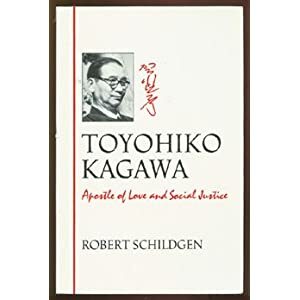 When Toyohiko Kagawa was asked to come and speak to the seminarians at Princeton--one of his alma maters--he went willingly and eagerly. Toyohiko had been displeased with much of his own seminary experience because he found that the students there were far more interested in arguments, rhetoric, persuasion, and the fine points of doctrine and textual study. He repeatedly begged them simply to live out what Jesus had taught in the parable of the Good Samaritan. He knew he was asking for much of the seminarians but he hoped that they would--as far as people go--be the most likely to answer a call to genuinely and sincerely practiced allegiance to Jesus as Lord and Savior. When he finished speaking to the assembled Princetonians he accepted some questions and then dismissed them quietly and gathered his things from the podium. As he was doing so, two of the seminarians turned to each other in their seats and discussed his lecture. One insisted that it had not been quite what they had expected from a man who was so well respected around the seminary. Turning to his friend, he quipped, "He didn't have much to say, did he? "They shared their own little laugh knowing that they were better educated than Toyohiko but not knowing that they were still fools. Both of them had heard of his background and how he had been the illegitimate child of a powerful Japanese man and a geisha. He was hated by his mother and liked by his father but soon both his mother and father had died and he was orphaned. He was given over as the ward of the widowed wife of his father. She and her mother struggled not to resent little Toyohiko because it had not been his decision to be a child of infidelity but they failed in their struggle and Toyohiko knew he was hated by them. They sent him away to a boarding school. He began attending a bible study given by a Christian minister so that he could learn and practice his English. Yet while he was learning the language, he was hearing and considering the truths and teachings of the Faith of the minister. When he was a teenager, he converted to the Christian Faith that had gripped him by the heart over a long time of reflection and meditation. Soon after this conversion he knew clearly that he would be a minister of the Gospel that had spoken to him when he had walked in darkness, desperation, and death.